New SEAT Ibiza from £199 per month with £1750 Towards your finance deposit. Plus save an extra £500 when you book a test drive*. The alluring and distinctive sharp lines of the New Ibiza create an impression that’s hard to resist. Its streamlined proportions gives it road presence that makes it really stand out from the crowd. The New SEAT Ibiza is beautiful both inside and out. Designed to give you an unbeatable driving experience, the high quality interior finish and advanced driving technology make it easier for you to enjoy the ride. It’s easy to be yourself with the SEAT Ibiza. Choose the trim. Choose the colour. Choose the wheels and upholstery. You’re in charge. 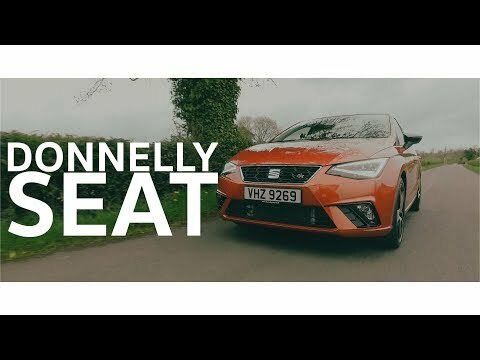 Book your test drive today with Donnelly SEAT and discover why the SEAT IBIZA was named WHATCAR? 2018 Best Small Car! Electrically adjustable door mirrors and more. *UK residents age 18+. Participants must book a test drive and place an order between 1 April and 8 July 2019 with a participating Dealer. Retail sales only. May be redeemed against the on the road price of a new SEAT vehicle. Participating UK Dealers only. Contact your Dealer for further details, including details of if and how the offer may be combined with other offers. This offer may be varied or withdrawn at any time. With Solutions Personal Contract Plan. 18s+. Subject to status & availability. T&Cs apply. Ordered by 8 July 2019 from participating Dealers. Indemnities may be required. Not available in conjunction with any other offer and may be withdrawn at any time. Accurate at time of publication April 2019. Freepost SEAT Financial Services. ^Up to 2 yrs/20,000 miles (whichever comes first). Includes year 1 & 2 services. Excludes CUPRA Ateca.